I got a question: what other vehicles are people dwelling in? 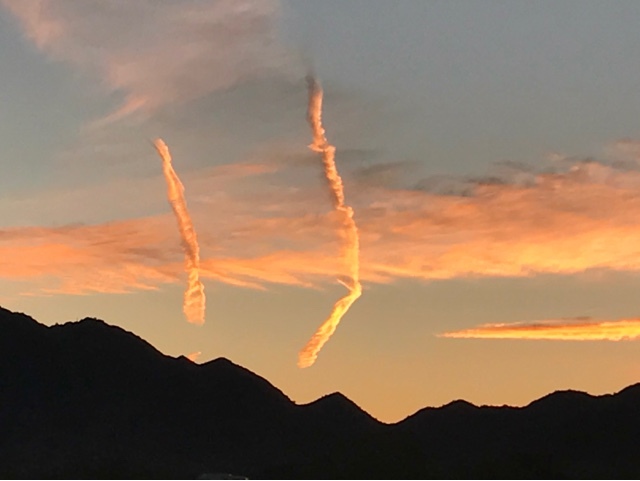 - Many cars / Prius's to large minivans as seen above. Large minivans are popular as they provide more space and get around 27 mpg. The vans above are at the entrance to the main road at the RTR this morning. - Many full size vans / commercial and custom types. There are all types and sizes from older Chevrolet, Dodge, and Ford to modern Sprinter type made by Freightliner, Dodge, and Mercedes. - Many Trucks with caps and campers. - Many trailers from commercial trailers modified to live in to Travel Trailers and Fifth wheelers. - Many miscellaneous - Buses, box trucks, and Tractor Trailer cabs. It's a smorgasbord of vehicles and people of all different live styles and it makes the RTR special. I can park my Prius next to a Class A motor home and we are all welcomed. 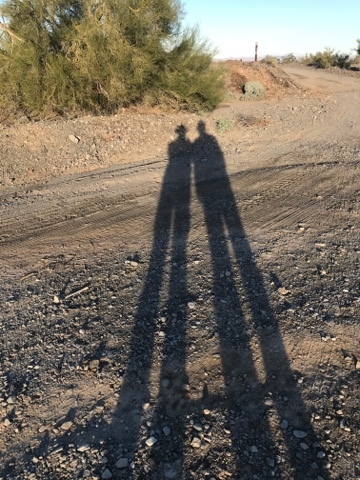 Above Dave and I with extra long legs in the low morning sun on our walk. After the walk I gave myself a haircut and wash - yes in the Prius with the heat on as it was 43 degrees this morning. I missed the round table discussion at this mornings gathering because it took me longer to cut and wash my hair. This morning we walked a bit further and I recorded the return trip. 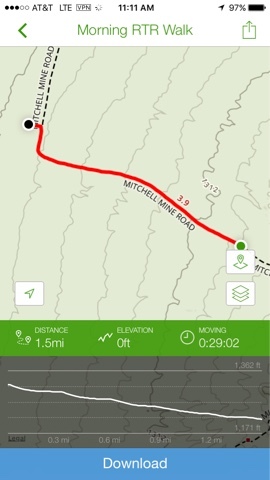 3 miles round trip up the road towards the mountains for back as the sun warmed us. I went looking for my replacement inverter for my Prius Campervan. 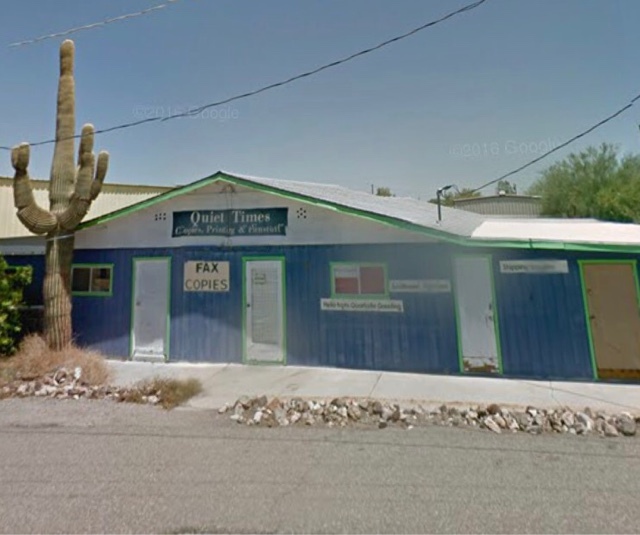 I ordered it when I got here and sent it to Quiet Times in Quartzsite. Amazon status shows it was delivered last Saturday, but it hasn't arrived to them yet They believe it at the Post Office and hasn't been sorted because of weekend and MLK Holiday. I will make another trip into town tomorrow before we put a tracer on the shipment. 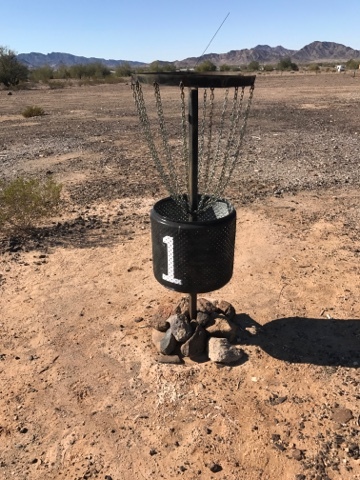 Blaize, vandweller friend and new author, had found a disc golf course in Quartzsite yesterday and shared it with me. I had checked years ago for a course in the area and there wasn't one. I gather it is new so I wanted to check it out when I was in town. 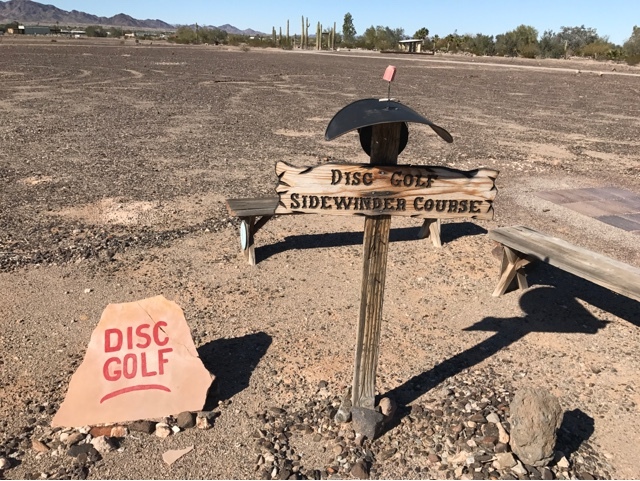 The Sidewinder Course is a nine hole course that raps a park on 3 sides and is reasonably listed out. The baskets are handmade with a washtub basket. The basket is not regulation size and makes getting a basket with a disc more difficult. Of the 9 hole course I was one over on the first hole, and then I pared 4 and was one under on 4. It was the best I ever did on a course! 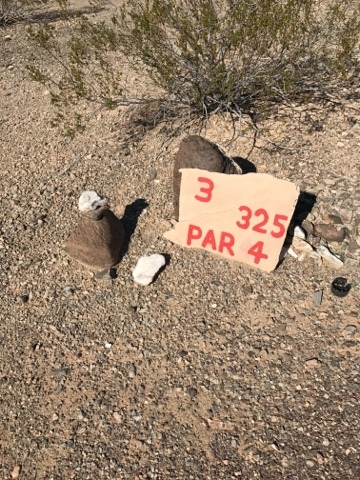 Some of the holes are par 4 and one was par 5 and I was under on these. The course is generally open with a few small trees that you can fly your disc over. All the drives are straight ahead from the tee pad.